"Iles flottantes", which you could literally translate from French as "floating islands", are such a delicious dessert; poached whipped sweet egg whites that resemble a fluffy marshmallow, served on top of a crème anglaise, which is a light liquid custard, with roasted almonds and caramel. Is it enough to make your taste buds drool?! Great, so let's get this recipe started. Start by preparing the custard, as it will have to rest in the fridge. Slice the vanilla pod open along its length. Pour the milk into a saucepan and add the vanilla pod. Warm up the milk to let the vanilla infuse, but make sure to not boil it. After 5 to 7 minutes, the milk should be infused and warm. 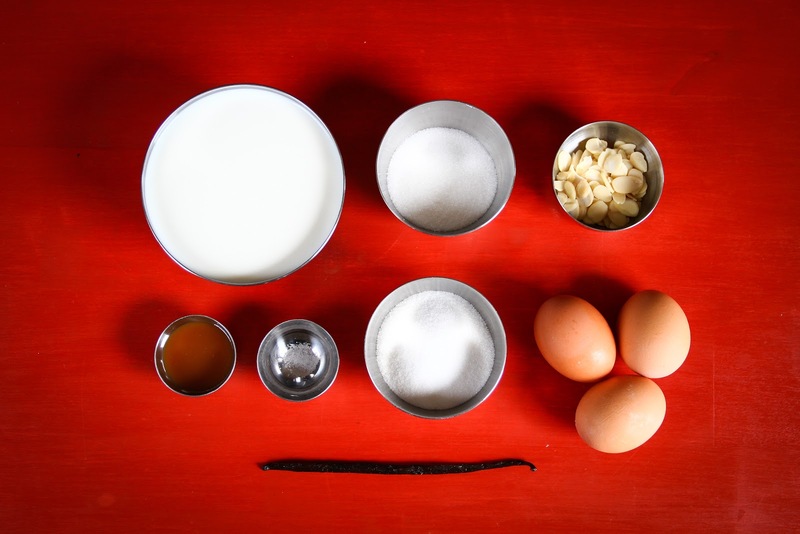 Remove it from the stove, remove the vanilla pod, and set aside. Add the egg yolks and the sugar to a bowl, and whisk until you obtain a smooth and silky mixture. Add the milk to the egg yolk-sugar and mix it in well. Place back on the stove on low heat. For about 7 to 10 minutes, don't stop mixing gently and make sure to not let it come to a boil. Once the custard is smooth and warm, remove it from the stove and filter it into a bowl to rest first. Then, let it cool down before placing in a airtight container in the fridge for 2 to 3 hours. About 15 to 20 minutes before serving the dessert, take the custard out of the fridge and set aside. It is also now time to prepare the rest of your dessert. 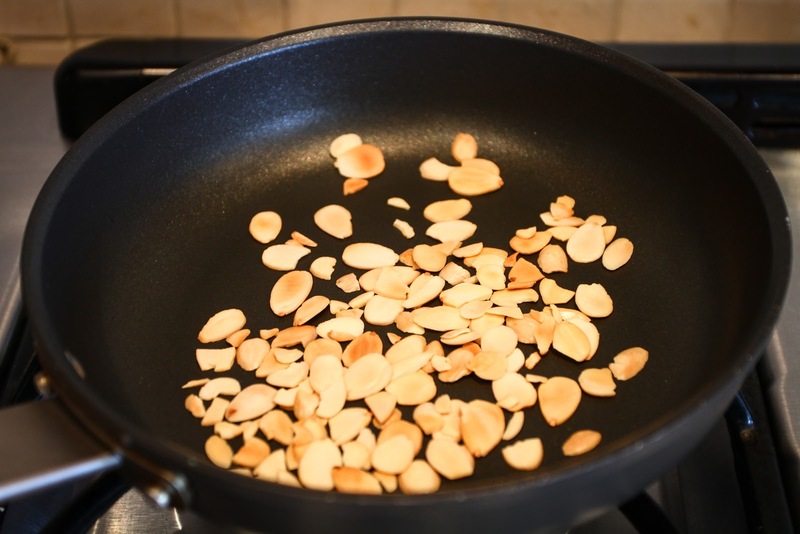 On medium heat, dry roast the sliced almonds in a pan. 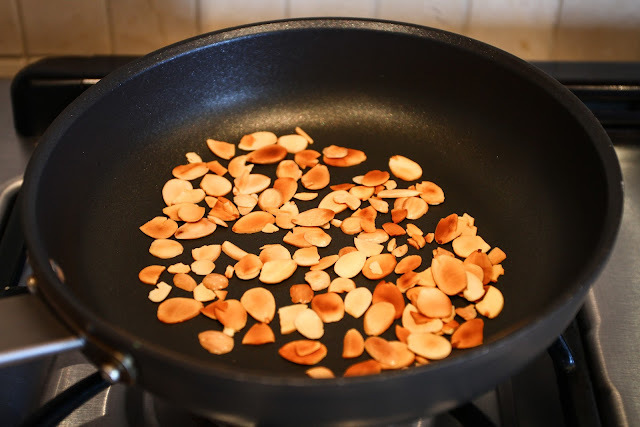 Keep an eye on them as they brown quickly and can burn easily. 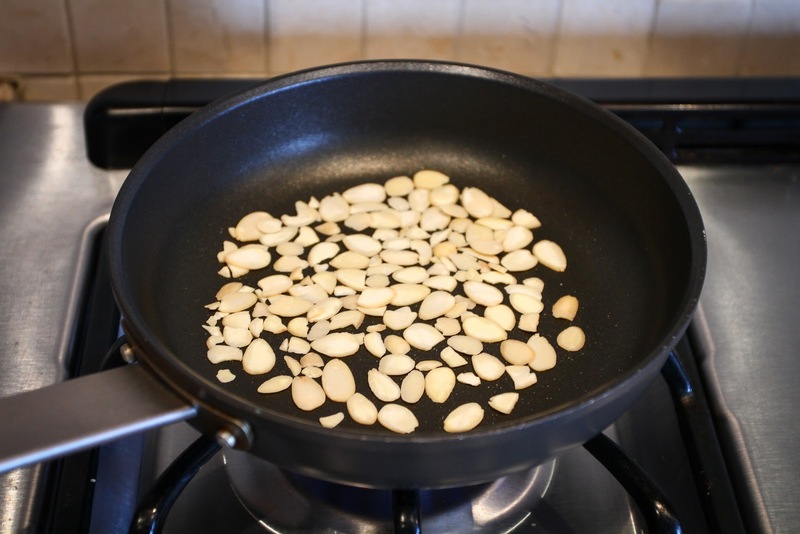 Once they are brown, take them out of the pan and set aside. Start preparing the îles flottantes. Beat the egg whites with a pinch of salt with a hand-mixer until they are firm. Then add the sugar while continuously beating. Once the egg whites are ready and firm, it is time to poach them. Bring a pan of water to a slight boil and add a scoop of egg whites and let it poach for about 30 seconds. Then, turn it over and let it poach for the same amount of time. Let the egg whites rest and drain for a minute or so on a paper towel. Now that all the ingredients are ready, you can dress your plate. Pour some custard, place a poached egg white, sprinkle with some roasted almonds, and drizzle some caramel. And here you are, ready to enjoy your delicious îles flottantes with crème anglaise, roasted almonds, and a drizzle of caramel!